Born 1935 (d. 1999) lived in Huntington, West Virginia. We had traveled to Lexington, Kentucky to attend the opening of "Generations of Kentucky." The show paired the objects made by Kentucky Folk Artists with the sensitive and powerful black and white portraiture of photographer Guy Mendes. The show was a collaboration between the Kentucky Art and Craft Foundation, project director and dealer, Linda Schwartz and guest curator and dealer, Larry Hackley. The traveling exhibit with seven stops, highlighted twenty plus artists and unique relationships (ie. generations) which existed and influenced their lives and work whether husband and wife, or father and son, etc. The exhibit was presented in the first floor lobby, of a building which contained the Bank of Kentucky, called the Galbreath Gallery. We enjoyed the show as well as the patrons, organizers, and artists who celebrated the show. We spoke with Larry Hackley and congratulated him as well as Linda Schwartz. Linda Schwartz suggested we visit her second floor gallery before leaving that night. We did and discovered yet another artist over whom we would fixate, even now. Gerald "Creative" DePrie's large drawings were made with colored pencils, graphite, and sometimes ink. Linda had appropriately framed and hung them for contemplation. The subjects were varied, ranging from what looked like egyptian pyramids, to suspension bridges, in addition to ethereal figural work. DePrie's eye was unlike any we had seen. Original, we were mesmerized. We spoke with Larry Hackley about DePrie. We asked why we had not seen his work but realized that Larry had only recently set up his gallery in Winchester. We visited the gallery where he had many unframed drawings protected in flat files. 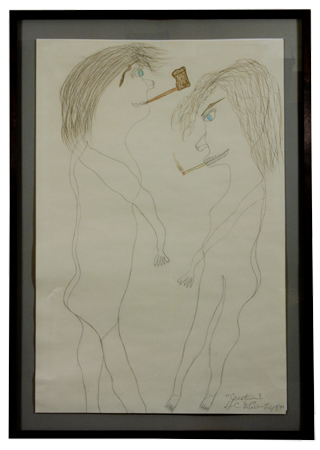 We purchased the figural "smoking couple." We also purchased at Hackley Gallery what Larry and we referred to as DePrie's "rosetta stone." It depicted a group of many of his favorite characters which we saw versions of, repeated in various other drawings. We also discovered in one of our many road trips to Huntington a wonderful portrait of what we believe are a happy couple. 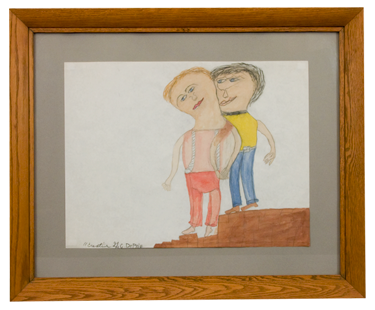 The drawing perspective is a little off relative to the steps and how they are holding hands but it is another great early piece, signed but without date. 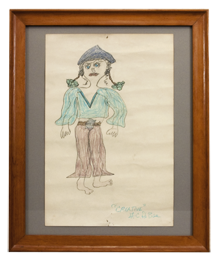 We were later fortunate to purchase other DePrie work at the auction of Eason Eige's personal collection presented at Garth's Art & Antique Auctions in Delaware, Ohio. One of the pieces was a couple, she with a flip hairdo in a pink slip and bra and he in blue shorts. The gold leaf frame seemed ostentatious initially but decidedly adds a certain warmth to the work. 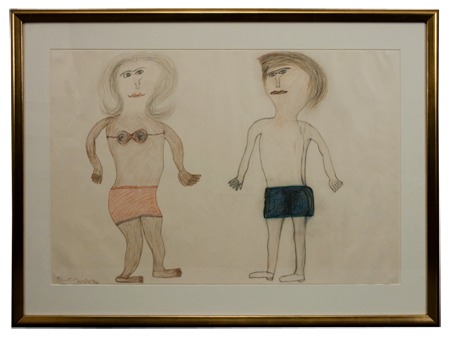 As usual, DePrie drew the outline of the bodies and then added the clothing. Two other pieces were purchased from Minnie Adkins. They were pieces she had long since "rolled up and stashed away" from a trade they had made years prior. She was delighted to sell the drawings. One piece was a girl, her hair in pigtails, wearing bell bottom pants. She said it resembled me. 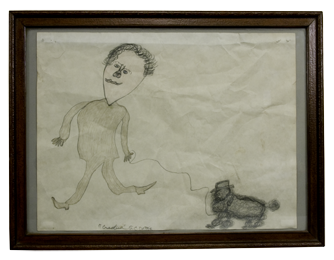 Another "Creative" De Prie drawing depicted the retired Director of the Museum of Art, Huntington, West Virginia, Eason Eige and his miniature poodle leashed and wearing a hat. 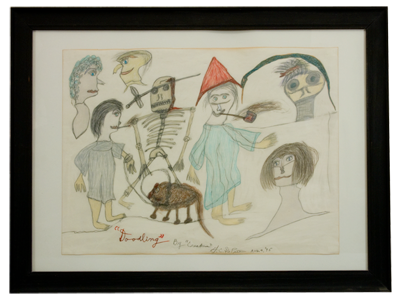 We are grateful to have been provided the opportunity to purchase, frame, and display this important work.